[AUTO](RC):When placed, COST [Counter Blast (1) & Soul Blast (2)], draw two cards, put a card from your hand into your soul, and increase this unit’s [Power] by the [Shield] of the card put into your soul until end of turn. 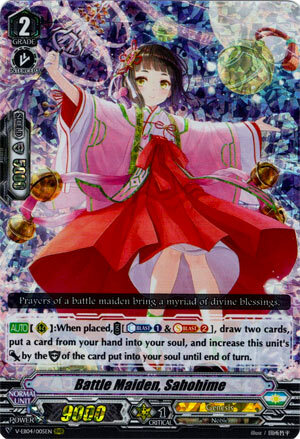 I guess given the deck Sahohime at least manages to accomplish the goal of not eating CB for the sake of lowering a SB cost. What’s more, she does allow you to send some Draw or Critical trigger to the soul to load up Himiko for the final push even with the cut in net soul overall if you cannot score Iwanagahime. The 9k power and few cards to scale her back with is a bit of a turn-off as is the fact that the skill that’s only good on RG circle, but is still a staple at 4 if you care about Himiko at all (and you should given she’s their only good boss card).